When will the markets and economies recover? In Albert Camus’ celebrated book, The Plague, we read of an insidious outbreak of disease accompanied by a rat infestation in the French town of Oran. At least, that’s what we appear to be reading, but the story is actually an allegorical reference to the inexorable Nazi occupation of France. It seems to me that the potential A(H1N1) threat could be read as an allegory for the impending danger of the global financial crisis. Here, we have a life-threatening sickness sneaking unseen into the country to wreak havoc and destruction. We can see minor signs popping up at random but the real tsunami has not hit us yet and already, we are reading of early signs of recovery. It’s like sitting in a dark ride at the amusement park, waiting to be smacked in the face by a wet fish. Just how the region is doing in terms of economic growth is shown on the “weather” map. Predictions on exactly when recovery will set in seem to depend on which channel you watch. Certainly the Malaysian market has seen some bright points recently. The relaxation of local equity requirements for foreign investors has already generated renewed interest in the commercial property market. There is a strong possibility of new foreign capital inflows and some of the many investment property sales that collapsed in the second half of last year could well be achieved this year. Malaysian commercial property remains attractive in terms of yield, price and growth potential and having seen a recent minor value adjustment of around 15%, it is looking better value than ever. Be prepared for a number of major sales to be announced in the next 12 months, to both foreign and local investors. The top-end residential market, while falling some 25% in value from its peak, has shown remarkable resilience and even renewed confidence. For example, the recent launch by Eastern & Oriental Bhd of their St Mary’s serviced apartments in the Golden Triangle has met with strong sales at around RM1,000 per sq ft. Sunrise Bhd has seen similar success with a new release in Mont’ Kiara, and Mah Sing Bhd has reportedly done equally well with its super-sized three-storey link houses in Batu Maung, Penang. Globally, the office leasing market has felt some of the greatest impact of the financial crisis, with many multinationals resorting to deep cuts in operating costs, large-scale retrenchment and a freeze on new investment. Regionally this has dragged rental values down. 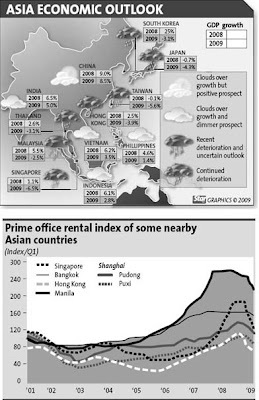 In Malaysia, the office leasing market has been a victim of circumstances since the beginning of the year and we hope we will not see a reenactment of the stagnant period from 1999 to 2006, with companies reluctant to expand. Personally, I remain optimistic because the growth of the services sector is likely to pick up and will be boosted by a climate of liberalisation. Nevertheless, what we might see in the investment market is a greater differentiation in value between fully let buildings and those sold vacant or off the plan with no rental guarantee. The appreciation of yield and the quality of that yield is a science that finally emerged in 2005 when the Securities Commission announced its new guidelines for the formation of real estate investment trusts and caused a scramble for investment properties. We are still waiting for banks to embrace this movement and provide more longer-term finance for commercial properties. There is some cause for optimism with the recent growth of regional equity markets and successful elections in Indonesia and India. Maybe, that wet fish won’t come after all. The writer is executive chairman of Regroup Associates Sdn Bhd property consultancy. SYDNEY: It’s failed and saddled with debt, but Li Zhang, a Chinese investment manager who came to Australia about 20 years ago, sees a lot of potential in shopping mall owner Centro Properties Group. Zhang, his friends, relatives, and some companies in China as well as in Australia have pitched in as much as A$50mil to buy an 11.8% stake in Centro. As Centro continues to face refinancing issues, Zhang says his group is even trying to line up a Chinese bank to shoulder Centro’s debt. From individuals to institutions, Asian investors are setting their sights on Australia. China, in particular, has shown strong interest in Australia, as highlighted by state-owned metals firm Chinalco’s plan to invest in Australian miner Rio Tinto. Although the Chinalco-Rio deal fell through, in the property sector, Chinese and other Asian investors are actively bidding. “We closed bids on 1 Martin Place, a very prominent building down here (in Sydney), and a lot of the bids were out of Asia,” said Richard Butler, senior managing director for CB Richard Ellis International Investments. Overseas investors accounted for 12% of total transactions in Australia in the first half of this year, up from around 9% in 2008, according to CBRE. Australia has weathered the global financial crisis relatively well, avoiding a recession so far. Capital values for commercial properties in Sydney declined some 15% in the first quarter of 2009 from a year earlier, compared with a more than 30% drop in Shanghai, Hong Kong, Tokyo and Mumbai, according to Jones Lang LaSalle. Rents fell around 25% in Sydney while Singapore, Tokyo and Mumbai saw more than 30% drop in the first quarter, said JLL. Australia has already seen some big names tapping the market. South Korea’s Woori Investment & Securities Co is in the process of buying two buildings in Australia for about A$600mil. Japanese home builder Sekisui House in May concluded a A$190mil joint venture with Australian firm Payce Consolidated to develop homes in Sydney and Brisbane. On a residential level, Australia relaxed its policies late last year, allowing temporary residents to buy houses without notifying their acquisitions to a government body, giving a boost to the home sector. “There is a fair bit of movement, with wealthy Chinese having their children study in Australia,” said John Bongiorno, director for real estate agent Marshall White based in Victoria. The company is considering opening an office in Shanghai or Beijing to attract more buyers. “They are attracted by the safety of the country, by the high standard of education we offer, by the high standard of living we offer,” he said. Asian investors were dominant buyers of Australian properties in the late 1990s when the market went through a downturn partly due to oversupply. Those investors from the Asian Tiger economies later became net sellers as the market recovered and property yields compressed more than 100 basis points, pocketing hefty returns. Now, analysts say the timing may be good for foreign investors to enter the market, with many local players inactive due to tight credit, and pension funds, which have overweighted property, remaining sidelined. David Green-Morgan, Asia-Pacific research director for DTZ, expects transactions to pick up as foreign investors are likely to rush and get the best deals. Some experts said Asian investors were looking for long-term investments to get steady cash flow, but Morgan said some may only be looking for a relatively short-term investment. HONG KONG: Despite both the local and global economic uncertainties, property sales in Hong Kong were active in the first half of 2009, according to Colliers International in its mid-year review and forecast (May 2009 - May 2010) report. The report said on July 16 that capital values and rental declines in residential property are expected to improve within the next 12 months due to increased liquidity in the market. The report stated luxury residential sales market outperformed both in volume and prices in 1H2009, and this positive growth in sales is expected to continue. According to the report, properties valued at HK$50 million or above in traditional luxury residential districts recorded an increase in the number of transactions by 114%, total turnover by 92% and unit prices by 23% compared to 2H2008. Luxury property prices are projected to grow over 5% in the next six to 12 months, with rental yields anticipated to be between 2.5% and 2.8% as local banks continue to offer low interest rates amidst anticipation that the economy will stabilise in the near future. Supply in luxury residences is also limited. Colliers International Hong Kong managing director Richard Kirke said many investment institutions are net sellers or they stay on the sidelines looking for assets with high yields. “Cash-rich private investors are the active buyers currently in the market. With the high interbank liquidity, the anticipation of approaching the bottom of the downturn cycle and possible inflation, all these stimulate buying demand." Colliers' regional director of Asia Investment Sales, Antonio Wu says the investment market has showed signs of improvements. "There was a mild drop of 2% year-on-year (y-o-y) to HK$16.24 billion in the total value of property investment transactions in 1H2009. However, the number of transactions rose by 12.5% y-o-y to 162 cases during the same period," he said. Wu says half of the total investment transactions were concluded in May and June, with major buyers among cash-rich investors and families. However, occupational demand has remained subdued, causing downward pressure on rentals especially in Grade A office sectors for the past six months. Rentals for Grade A office leasing fell 12% quarter-on-quarter (q-o-q) in 2Q2009 and 24% since beginning of this year, and projected to decrease 15% in the next 12 months and likely to bottom in mid 2010. Existing tenants are opting to downgrade their offices, some relocating from Causeway Bay to Kowloon East for example. For the industrial sector, weak trade activity dampened leasing demand, causing a fall in rentals. Industrial rentals fell 5% q-o-q in 2Q2009 and 10% y-t-d. Despite all this, due to the funds inflow, prices of industrial properties recorded an increase of 6% q-o-q in 2Q2009. Industrial rentals and properties are projected to drop 14% and 9% respectively. Retail sales have seen negative growth since February this year, resulting in a greater number of vacant shops available for lease. Retail rentals in core shopping areas fell by 5% q-o-q in 2Q2009 and 8% y-t-d. According to Colliers, retail property rentals for ground floor shops in core shopping area are projected to fall a further 12% in the next 12 months. KUALA LUMPUR: Magna Prima Bhd’s wholly owned subsidiary Monetary Icon (M) Sdn Bhd has entered into a conditional agreement with Seri Dinar Project Development Sdn Bhd to buy from the latter 5.56ha of freehold land and parcels of leasehold land totalling 6.79ha in Gombak, Selangor, for RM40.5mil cash. Magna said in a filing with Bursa Malaysia that the group’s development plans, for which Seri Dinar has obtained a development order, comprise shoplots, apartments, houses and a clubhouse. The estimated gross development value is RM130mil, of which the gross profit margin is expected to be about 20%. PETALING JAYA: UOA Real Estate Investment Trust’s second-quarter ended June 30 net profit jumped 24.79% to RM7.55mil while revenue rose 3.16% to RM11.28mil from a year ago on improved gross rental in the first half of the year. The trust told Bursa Malaysia yesterday that gross rental had improved by 12.11% or RM2.44mil in the first six months over the same period last year, attributed mostly to improvements in rental rates. Operating expenses had decreased 12.04% from the same period last year while net profit for the six months to June 30 was up 29.81% to RM15.05mil compared with the previous corresponding period on revenue of RM22.74mil. In a separate filing, the company said it was making an interim income distribution of 5.82 sen for the second quarter.